Girl Kuripot Girl Kuripot: Win Beauty Products from EarthlingGorgeous.Com Contest! Win Beauty Products from EarthlingGorgeous.Com Contest! What would I get out of 50x fairer skin? No one knows for sure. It might be a shot to get noticed for my face instead of other unflattering parts. I might just be discovered and become an overnight star. I was thinking something in the likes of traveling and not bothering what I look like anymore because I know I look gorgeous and perfect already (even if I eat a lot in my travels). It might just give a little boost of confidence. How about a confident, pampered and perfect traveling star? 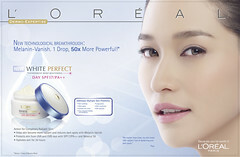 Like EarthlingGorgeous.Com, I guess I want to have 50x fairer skin too. She is also giving away P5000 worth of beauty products for this blogging contest. Non-moms can join too. 5 winners will win P1000 worth of items each. Submit your entries before the 1st week of December 2010! Thanks for joining Melody! Goodluck! Win 30 Trips in 30 Days with Intrepid Travel! 10 Free Guided Taipei Tours! WOW Amazing Asia Photo Contest!